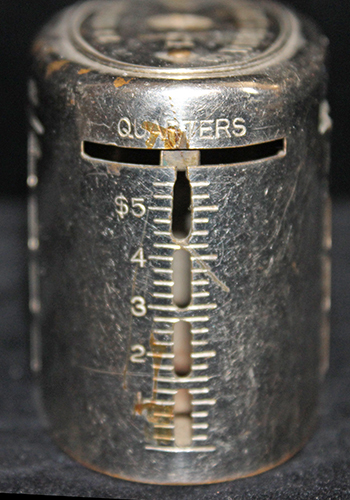 ARTIFACT: This is a coin bank advertising Piscataqua Savings Bank of Portsmouth, New Hampshire from the 1910s. Piscataqua is one of Portsmouths early banks and is still in operation, borrowing its name from the river flowing through town. 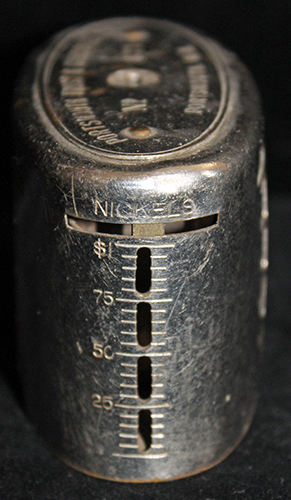 The bank is numbered 671, and has slots for all United States coins from pennies through half dollars and a hole in its base for paper money, as well as peek holes under each slot to see how much wealth has been accumulated. 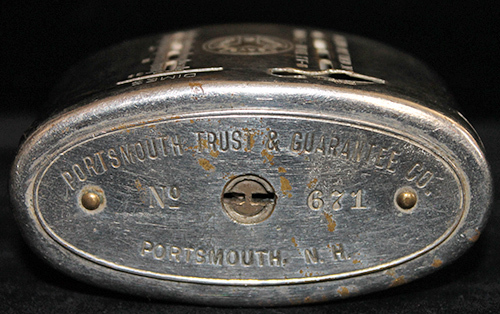 Top reads: PORTSMOUTH TRUST & GUARANTEE CO. NO. 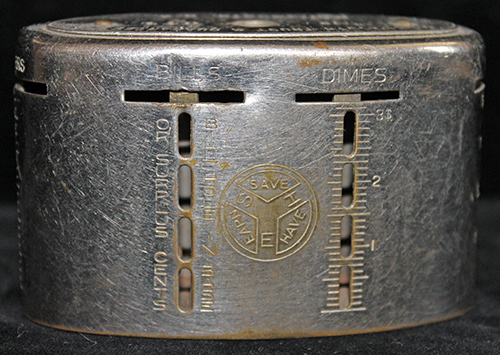 671 PORTSMOUTH, N.H. and the bottom reads: ORIGINAL COMPARTMENT RECORDING SAFE PATENTS  THE HOME TELLER  BILLS  THE AUTOMATIC RECORDING SAFE CO. CHICAGO U.S.A.
CONSTRUCTION/MATERIALS: Plated brass and brass with painted details. 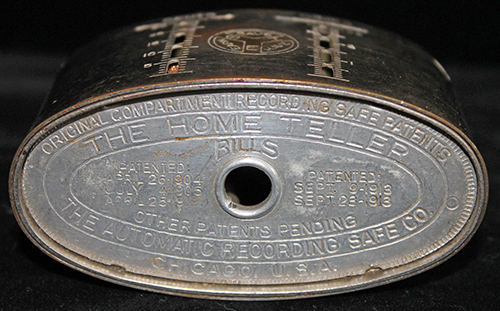 MARKINGS: Bottom reads: ORIGINAL COMPARTMENT RECORDING SAFE PATENTS  THE HOME TELLER  BILLS  THE AUTOMATIC RECORDING SAFE CO. CHICAGO U.S.A. PATENTED: APRIL 26, 1904 JULY 4, 1905 APRIL 25, 1911 PATENTED: SEPT. 9, 1913 SEPT. 23, 1916 OTHER PATENTS PENDING. 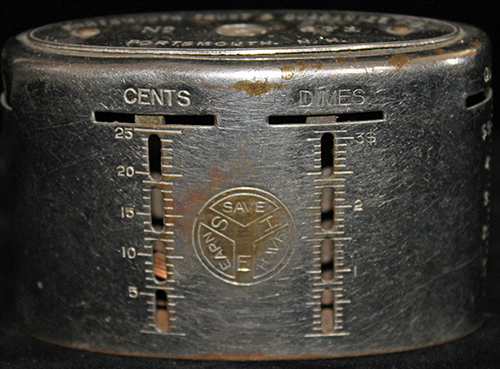 CONDITION: 8- (Very Fine-Excellent-): Bank shows moderate use, some impressions. Most of the plating remains intact and bank has a couple coins still inside.